Chances are, you actually use about four buttons on your TV remote, between switching it on, turning straight to your set-top box of choice, and sticking the volume up. So really, these cheap, simplified universal zappers that snap onto the side of actually useful remotes are all the control you need. Sideclick (it’s like a sidekick, but with buttons, see?) 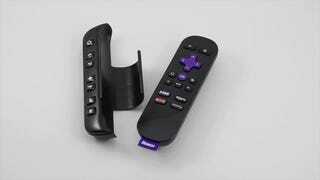 is a dead-simple universal remote that has a holder for your set-top box remote. It’s not an adjustable holder, so you’re limited to Amazon Fire TV, Apple TV, Roku, and the Amazon Fire TV Stick. The remote runs off two AAAs, and best of all, you can program the six buttons to whatever functions you want — it can ‘learn’ any infrared remote signal, so you can set the channel buttons to be extra power buttons, if your heart so desires.